Like with everything, change happens naturally. The majority of the times in pay per click advertising, change is technologically based. Google are constantly innovating AdWords to make the user experiences better and to keep them ahead of the competition such as Ad Dynamo and . A change that all advertisers have to face no matter what advertising form they use is seasonal. As the year progresses, so does the season from summer to autumn, winter and spring. 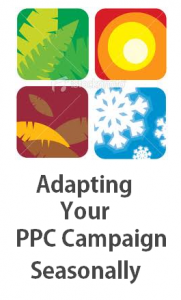 You will need to adapt your campaign so it has maximum performance in each quarter of the year. Leaving a campaign stationary while change occurs all around it is a reason why it may not become successful or profitable. Summer food (e.g. ice cream and cool drinks). Your aim in the month of summer is to relate your advert to what people are facing. In summer, it is quite a joyful season because it is usually the hottest season with many people going on holiday. Therefore, take advantage of this! For example, if you were selling video games, you could have an advert explaining how ‘this’ video game is the perfect game to play on long flights seeing that when going on holiday, many more people will fly. Summer is also the season where most people fly. When your campaign reaches autumn, people are starting to prepare for Christmas and many are having climate changes from hot to colder. However, it is more widely known for ‘Back to School’ season for the reason that the majority of schools go back to school in September time. From this, try to link your product with being essential for going back to school. Every business does this such as Apple. You could even have a discount on for students to encourage them to buy and click on your advert: discounts get everyone excited! Some business make over 70% of their yearly revenue in December, winter. Therefore, it can be seen to you and your campaign that winter will be and is the most important season. With everyone having saved lots of money over the year to spend on others for Christmas, you can use your campaign to take advantage of this. Competition will increase which means you may have to increase your CPC to accommodate. What you need to remember is that in winter, everyone has money to burn. They want gifts: they want to buy things. Use this in your campaign to your advantage. You also have January in winter which means you may be able to link your campaign in with new year resolutions. With winter being the most successful season for many, it can then be seen that spring is the least. After spending in winter, everyone is strapped for money and cannot afford anything. This means less people can buy things. But, spring is also the season where there is the biggest boom in technology. With Apple and many other businesses releasing gadgets and lots of people from Christmas getting internet capable devices, the amount of people online will increase. Spring is probably the season where CPC is at its lowest which means you will be able to get traffic for a lot cheaper to your landing page than normal.